Long day at work? We understand that after a long, tiresome day sometimes you simply need a little luxury in your life and time to pamper yourself. With the Beurer Sofa Heating Pad HK 48 you can truly indulge yourself – be warned, you’ll never want to get off your sofa again. Breathable, cosy and skin-friendly this heating pad will make you feel cherished, comforted and totally at ease as you snuggle up to it. 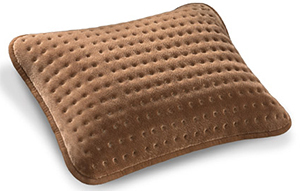 A beautifully soft cushion with an integrated heating pad in the cover; the heated pad incorporates 3 illuminated temperature settings with a rapid heat up function so you don’t have to wait long to enjoy the soothing heat it produces. Also there is no need to worry about drifting off to sleep with it because there is an automatic switch-off function after approx. 90 minutes. Don’t be afraid to use it again and again because the heat pad has BSS® overheating protection and electronic temperature control for your ease of use and peace of mind. You can wash your new favourite cushion cover at 30°C so it remains clean and ready for use at all times. Moreover, the textiles used for this heated cushion cover meet the stringent human ecological requirements of Oeko-Tex Standard 100, as verified by Hohenstein Research Institute. Heat can help to dilate blood vessels surrounding the painful area. This increases the transportation of oxygen to the muscles helping to heal damaged tissues. Heat application helps to ease the muscles and stretch them providing you with a decrease in stiffness.